Whew, it’s been a big busy week for us. We had thunderstorms and LOTS of rain for our last weekend at Buttercup campground at Lake Cascade State Park. 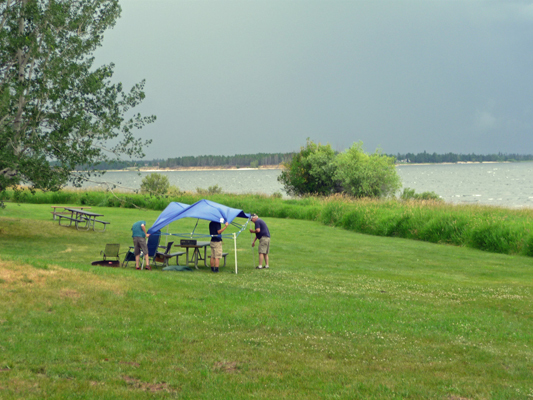 The campground emptied out quickly on Sunday but we still had a number of die-hard fishermen who stuck around determined to catch fish. I had managed to wash the trailer over the weekend between thunderstorms. It had only been 6 weeks since she’d been washed—back when we left Florence, OR--and it’s amazing how much more quickly and easily it went without a ton of dirt and dead bugs to deal with. I even got to wash the roof for the first time because we borrowed a ladder from the state park folks. The thunder storms has washed most of the accumulated pollen off the roof but it was still nice to get up there and scrub the roof which turns out to be white—which we didn’t know. Sunday evening we had some clearing and folks went out and played in the water. 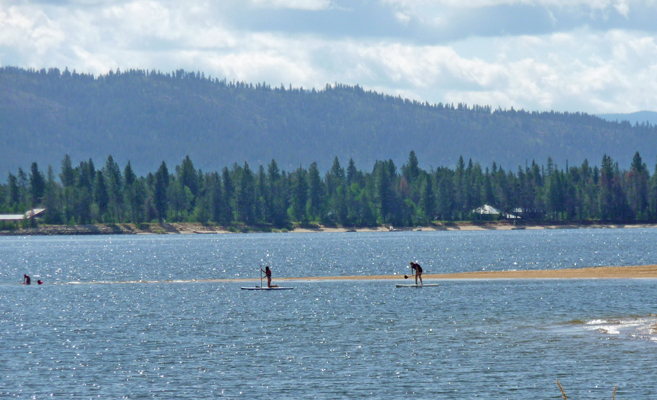 I caught these stand-up boarders playing near a new sand bar that had just appeared as the lake continued to be drawn down. Monday we took my little collection of plants over to Sugarloaf since we didn’t want to take them with us down to Boise and back. We left them with the camp host there who warned me that the ground squirrels might have a field day with them. He was right. 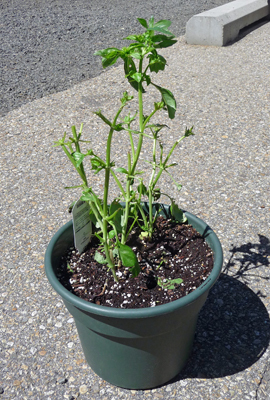 Here’s what my very bushy basil plant looked like 2 days later when we got back from Boise. Clearly that top cluster of leaves was just a little too tall for them. 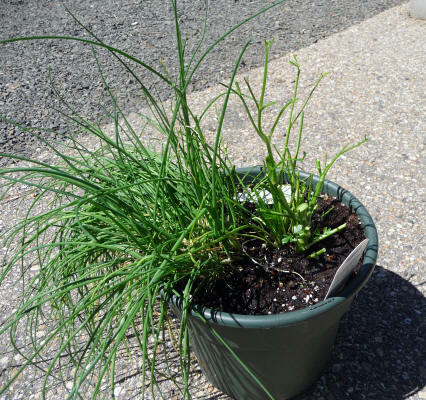 They ate the parsley down to a nub and a few sticks but didn’t touch the chives. They ate all the petunia flowers but didn’t hit the leaves much. And they left my miniature rose bush alone. After years of deer damage on my roses that was a real surprise. The rest of Monday July 13th was spent repacking the back of the truck with the new boats and all the other goodies that we’d accumulated in 6 weeks we’d been at Buttercup (like all that beer we were gifted over 4th of July). 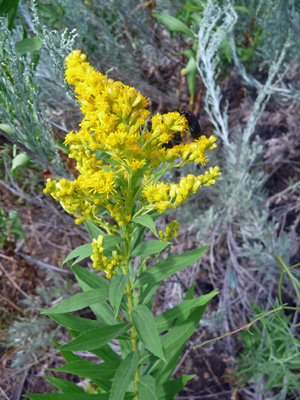 The Meadow Goldenrod (Solidago lepida) finally came into bloom along the edge of the creek at Buttercup. We’d seen it blooming in the ditches along the way to Donnelly but not in the campground until the last few days. Aside from the goldenrod most of the rest of the flowers were over in Buttercup but the berries were beginning to ripen. 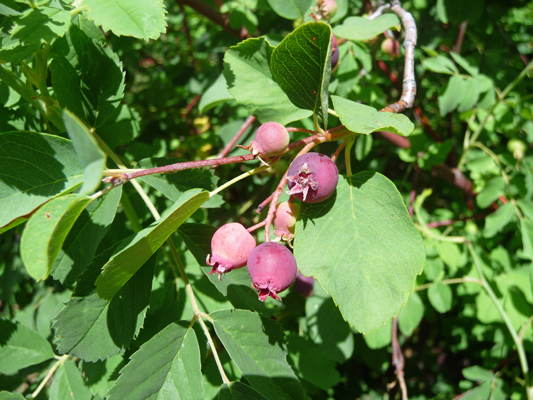 We’d spotted a number of Cedar Waxwings gobbling down black hawthorn berries around the campground. The robins seemed to like them too. They were feeding on the Black Currants (Ribes hudsonianum) by the boat launch too. 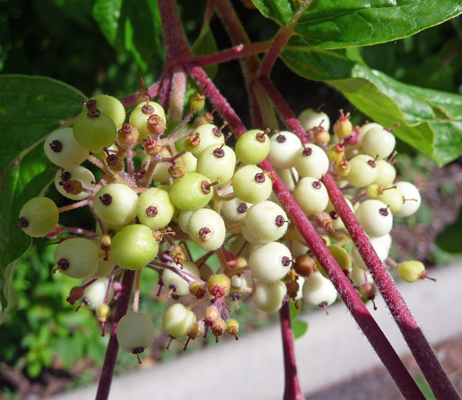 But I never saw anyone eating the Red Osier Dogwood berries (Cornus sericea) that were almost all ripe. 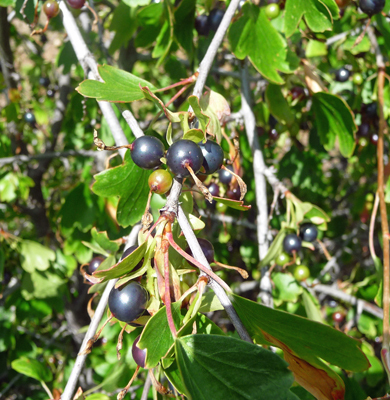 Someone in town told me that there were ripe huckleberries up the mountainside above us but we didn’t go looking for them. Monday afternoon a family moved into the campsite next to us and put up an awning over the picnic table. We had a thunderstorm blow through and I managed to catch their attention just as the awning started to hop its way across the grass with the canvas starting to peel off. It took 3 of them to get it corralled and down in the wind. Funny thing, they didn’t put the canvas back on it again while we were there. Tuesday morning we did our final rounds at Buttercup and then hooked up the trailer and motored on south. 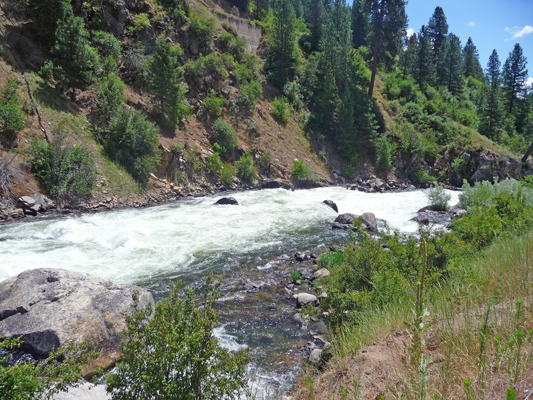 We took Hwy 55 south following the Payette River as it tumbles down the canyons. It was getting a new chip seal coating so the speed limit was 35 MPH—slow but better for taking pictures. There were lots of whitewater rafters out. We saw 10 or 15 of them on our way down. 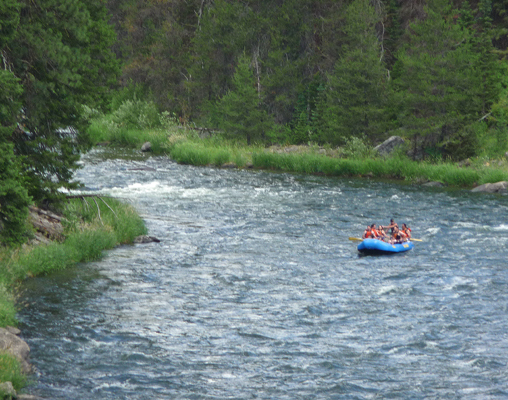 And there were whitewater kayaks running the rapids too. We stopped to switch drivers and these guys appeared over the edge of canyon carrying their boats. They were dripping wet with big grins on their faces because they’d just run this set of BIG rapids. The drive down Hwy 55 is gorgeous and if you ever get the chance don’t miss it. We spent the night on Tuesday July 14th at the Ambassador RV Resort in Caldwell on the west side of Boise. 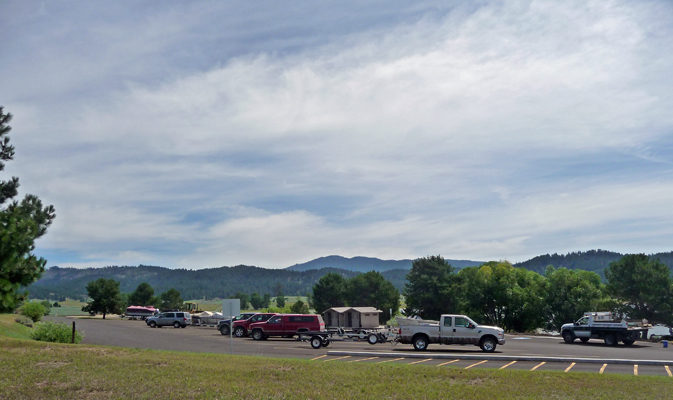 It’s a pretty nice RV park as such things go with big pull through sites and reasonable rates. They had a nice laundry room (with air conditioning) so I even managed to get our laundry done that evening. We chose it because it was only a mile from the Airstream dealer. 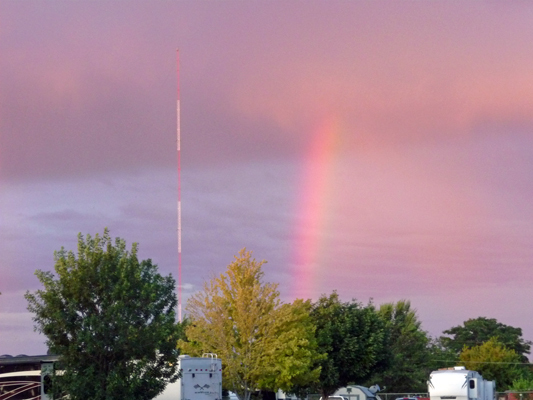 We had a little thunderstorm blow through that evening (it didn’t cool things down much) that produced a nice rainbow. We took the trailer in at 8 am the next morning to have our new shower door and range hood installed. Then we drove into Boise and had breakfast at Whole Foods. We spend the morning doing errands (Whole Foods, Trader Joes, REI, Sportsman’s Warehouse and Fred Meyer) and then after lunch at the Cracker Barrel (a first for us) we retreated to the Caldwell Public Library to use the WiFi in the comfort of their air conditioning, it being in the high 80’s at this point. They called us at about 2 to tell us that they “were as done as they could be.” When asked what that meant they told me that the new range vent was faulty and vibrated really badly. So they had put our old one back in and were ordering us another one. This one took 3 or 4 weeks to arrive so we can hope that it arrives before we leave Idaho to go back to Oregon at the end of August. Clearly we weren’t ready for the fan saga (which as gone on for over a year now) to be over. But it sure is nice to have a shower door that opens normally again. Hurray. 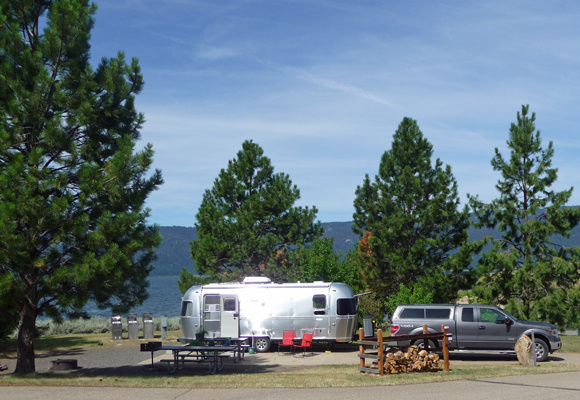 We headed out of Boise before the rush hour traffic and made it to Sugarloaf Campground on the east side of Lake Cascade by a little after 5 pm. Our new spot was open and waiting for us and we moved in without a problem. It’s a great open site with a nice patio area and a great view of the lake both from the patio area and from our dining room windows. Here’s a shot of a slightly wider view in the same direction taken from just north of us—there are camp sites with this view! Buttercup it just a bit further north (right) across the lake. We settled in, thinking a ranger would stop by and open up the ‘pipe chase’ (the closet on the outside of the rest room building) so we could get our radio and camp host materials. But it turned out that we’d just missed him and he didn’t swing through a second time that night. So we got a lot of peace and quiet our first night at Sugarloaf because the campground was pretty empty and we had no paperwork to be able to do rounds with, no keys to use to change the toilet paper and no radio to call in on or listen to. Thursday morning, July 16th, we got our first campground paperwork (the list of reservations) and finally saw a ranger mid-morning to get the pipe chase opened. All the materials were there but there was no radio. The previous camp host had taken it with him to his next assignment down the lake. Oops. It took them a while to figure it all out and we finally got a radio on Friday morning--which was good since the weekend turned out to be pretty wild. We have way better reception here than we had at Buttercup which is a relief since a good deal of the time we couldn’t understand Cascade headquarters and they couldn’t understand us and now they’re clear as a bell. Whoo Hoo. 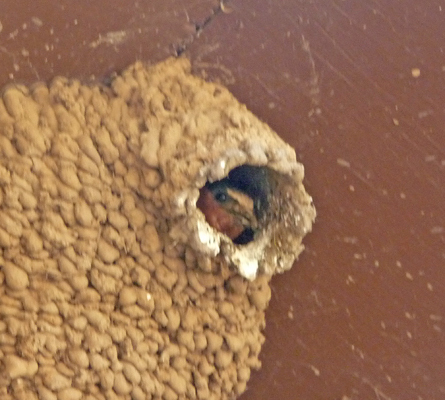 We did our rounds on Thursday morning and discovered that there was a sparrow’s nest built at the top of the eaves at the restroom—complete with a moth to the left of the hole. While I was taking this photo, a bird swooped out of the nest right over my head! 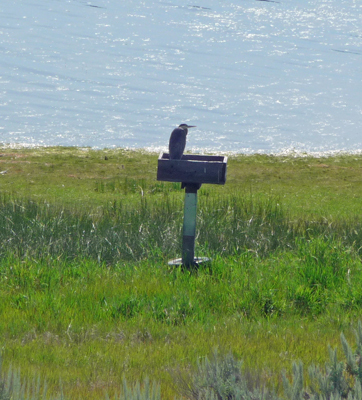 There was a Great Blue Heron out sitting on the nest box in the wetland to the east of the campground. And several large flocks of Canada geese in the same area. They sure look big when they come swooping in on the wing. Here’s the view looking east from the campsites on the east side of the campground. There are cattle across the way and if we have any problems with cattle it will be because the get around the fence that reaches across through the lake across the way. We can hope that they stay on their side. At least they are farther away than they were earlier this summer when they were just across the road from the campground and would sneak around the edge of the fences by the water and wander into the campground. 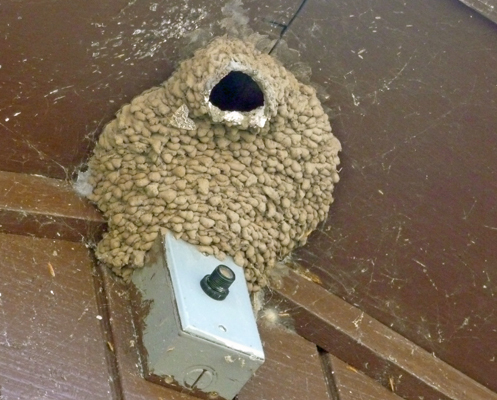 We made our way around the campground to the second restroom only to discover yet another swallow’s nest. This time I managed to catch someone looking out at me. We made the circuit and then went to have a look at things at the boat ramp which is just down the hill from the campground. It was Thursday mid-day and yet the parking lot was half full. Most of these folks are locals who come to fish for the day. By Saturday noon there was only one parking spot left. They have drawn down the lake a lot and there’s sandy beach all along the front of this parking lot and then in front of the Day Use Area that faces out onto the lake proper. There was a stiff breeze blowing and boats were having a bit of a challenge getting away from the boarding dock in the middle of the boat ramp since the wind was blowing them into the dock. But they made it okay. I explored the beach and took this photo looking up lake from the boat launch. The beach continues north to a little inlet just north of the campground. The grassy area across the inlet is where the cattle used to be and they’d sneak past the fence on the beach. Thursday our first new campers arrived and we got to experience telling people that they couldn’t put their tents up on the grass at Sugarloaf. One of the guys was NOT pleased and was very argumentative when I asked him to move his big tent. But we’ve got good reasons for it. The irrigation system was installed only a foot deep so people can easily pierce the pipes with their tent stakes. If that happens, they can end up with a fountain, or a slow leak under their tent. During the week, the irrigation can come on and get their tent wet. In addition, we have LOTS of ground squirrels and they have been known to eat though the bottom of people’s tents and get inside. A few weeks ago some folks put their tent on top of a ground squirrel hole. The next day they zipped their tent up and went off for the day. When they came back the squirrel had eaten through the bottom of the tent, gotten into their food and then in a panic not being able to find his way out had used the entire inside of the tent as a latrine. That last story really makes an impression and funny thing, we’ve gotten no more arguments since we’ve started including it in our spiel. Friday we got our radio set up and tested and got ready for the great onslaught of the weekend. We had 32 camp sites that were due to fill up that night including a tractor company who was having a company picnic. On the weekends, we have to record everyone’s license plate number and try to keep track of all the extra cars. We ended up making 3 or 4 trips up and around the campground to get all the numbers and answer the millions of questions folks had (and don’t forget all those stops to get folks to move their tents). Just as things were starting to wind down for the evening, we had the grandfather from a family reunion come and tell us that one of his son-in-laws was out in a small pontoon fishing boat (one of those single-man ones with oars) with his 5 year old son and had gotten bloom out of sight. The grandfather had gone looking for them as best he could with his truck (there are NO roads out to the edge of the lake around here) and he wanted to know where we thought they’d be. We had a brisk wind and my only thought was “down wind”. Walter had the presence of mind to say to call the ranger. Which I did. Thus began a run-in-circles process of trying to get all the information that search and rescue requires before they’ll send out a boat. Meanwhile the other son-in-law had found someone with a boat to go out and help them look. By the time I was about to make my 3rd trip over to their campsite to ask more questions, the news came that they had been found. All ended well, thank goodness. But still my mind kept asking, “What kind of idiot takes a 5 year old out in a tiny boat in shorts and a t-shirt at 7:30 on a windy night?” That was WAY more excitement than I needed especially after talking to so many folks about their tents and extra cars. A short time after that we looked out our window and noticed a group of 4 small boys (8 years old maybe) playing with matches and paper at the edge of their campsite. I walked over and announced to the adults that there were kids playing with fire over here. And they replied, “They’re just building a campfire.” I bit my tongue and ground my teeth and simply said, “We only allow fires in the fire circles.” Who in their right mind gives kids matches and lets them try to build a fire next to some pine trees and a stand of sage brush? That bit of drama distracted me enough so that the boat incident receded in my mind and I went to sleep with no problem. Saturday at about noon, we had a number of cancellations (the tractor company decided they didn’t need all those sites they’d reserved) and the great scramble by the folks who come up to the lake with no planning began. It amazes me that folks drive all the way out to Sugarloaf to see if we have openings when it’s 2 miles off the highway and we’re the only thing out on that road. Our 4 empty sites filled up in a flash. And we had a steady stream of folks looking for sites all the way until 5:30 when the last folks knocked on our door in the middle of a downpour. I sent them down to one of the first-come-first serve campgrounds and they ended up with the last site in the entire park. We were FULL to the gunnies which is very unusual except on 4th of July. 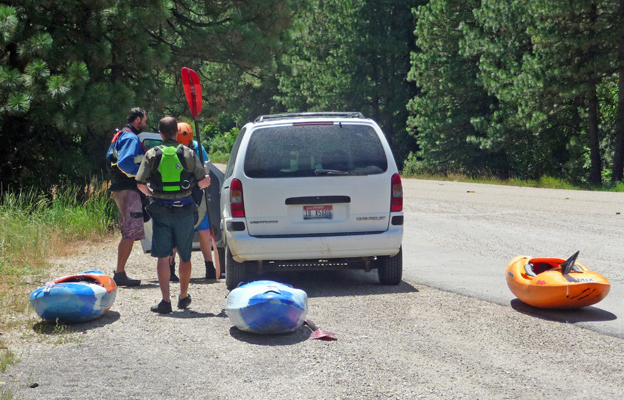 Our night ranger thought it way way crazier than usual which is a relief because there just seemed to be an awful lot of boats and extra vehicles and large numbers of folks in campsites—nearly as bad as 4th of July was—with more drama than usual too. It was good to know this wasn’t the new normal! Next weekend we have a Bass Tournament being held at the Sugarloaf boat launch from 5 am to 5 pm on Saturday. The bass fishermen have already started to arrive and will fish all week in preparation for the big event. Our boat launch parking lot only had one open spot at noon on Saturday, I can only imagine what it will be like next weekend. I think you could do this camp host gig for years and not run into all the possible interesting challenges that can occur. Sunday July 19th, the campground emptied out again. Ahhhh. We should have 4 quiet days to rest and enjoy ourselves—with no watering to do either! We hope to get the bikes and the kayaks out and have a bit of R and R!